Even then I knew this was a moment that would live with me for a long, long time. I just didn’t know how or when it would come back to me. Why David and Dennis were playing “Kawika” that afternoon, I don’t know. Most of us think of Dennis, who passed away in 2014, in reference to the popular songs he wrote: “Wahine Ilikea,” “Koke‘e,” and “Pua Hone.” But Dennis was, among other things, a gifted scholar of Hawaiian history and culture. And “Kawika,” recorded by Sunday Manoa in 1969, is considered by many to be the spark that ushered in the second Hawaiian Renaissance—a revitalization of the traditions, culture, and language of the Hawaiian people. Maybe it was part of a story Dennis was telling about King David (Kawika) Kalakaua, whom the song was written about. Maybe he just really liked it. It is a powerful piece of music. That rainy afternoon in Pahala, the Kamakahi’s playing “Kawika,” and Brad listening on the stairway. . . . .all that musical magic came rushing back a few weeks ago when Brad suggested creating and teaching an ‘ukulele ensemble for “Kawika” at the 2018 Hawai’i Island ‘Ukulele Retreat, October 14 – 20. And with Kaliko Beamer Trapp also on the staff, to teach Hawaiian percussion, language, and pronunciation, there was no question in my mind that “Kawika” was simply meant to happen. And so it will. Below is a link to “Kawika,” as recorded by Sunday Manoa. Enjoy. And while you do, imagine taking part in the musical ‘ukulele magic that happens each year in Hawi, at the northern end of the Kohala Coast. Registration is still open and the Kohala Village Inn still has a few rooms available. Even more reason to bring your ‘ukulele to Hawai’i! We have already listed all the reasons why you should come to Hawai’i to play your ‘ukulele, but we just added another! Because, if you are so inclined, at this year’s Hawai’i Island ‘Ukulele Retreat, October 15 – 21, you can also learn to play Hawaiian lap steel guitar with Konabob or with the “King of Mid-Western Swing,” Gerald Ross! This not only means we’ll be able to offer two 5-day classses in Hawaiian lap steel, it also means we’ll be able to offer it in two tunings: C6 (with Gerald) and G6 (with Konabob). Just take a look at what Gerald will be bringing our way! And this is in addition to the other classes in ‘ukulele, hula, rhythm, and story telling being taught by our esteemed staff: Kevin Carroll, Brad Bordessa, Kaliko Beamer, Lehua Wilson AhSam, and Lady Ipo. And it’s not just all about Hawai’i, either. It’s about the joy of music of all genres. Just look at what Kevin Carroll is bringing to the table: Celtic Music for ‘Ukulele and Tchaikovsky! So, the Kohala Village Hub in Hawi, is not only the best place to come learn to play your ‘ukulele this October, it’s just the best place to be, period! Please contact us if you’d like to join us. The rooms at the Kohala Village Hub are currently spoken for, but there are other options nearby. Lehua Wilson AhSam has been an integral part of the Hawai’i Island ‘Ukulele Retreat since we moved to the Kohala Village Hub two years ago. So, we thought it was time to let you all know a little more about her. Roughly interpreted: Lehua was born in Kaneohe, Oahu; raised in Hilo, Hawai’i; and lives today in “deep” Kohala with her husband’s family. But there is much more to Lehua Wilson AhSam than all the places she has been, and she continues to astound us all with her resources, talent, skill, and generosity. She is the “tock” to the “tick” of the Hawai’i Island ‘Ukulele Retreat: consistently sure and steady, relentlessly operating in the background (as the Executive Director of the Kohala Village Hub), and absolutely indispensable. She has a Bachelor’s Degree in Anthropology and a Master’s in Hawaiian Studies, is fluent in Hawaiian language, and teaches Hawaiian Studies at the Hawaiian Community College. She is also trained in Hula and has performed at the Merrie Monarch Festival in Hilo. . . . .and to hear her sing is to take a journey back to the time of the Hawaiian monarchs. Lehua is also a crew member for Makali’i, Hawai’i Island’s own voyaging canoe. It is Lehua’s passion for Hawaiian culture and all things wa’a (canoe-related) that will inform and enhance our “extra-curricular” activities, especially our visit to the Maka o Hule Heiau. It is her attention to every detail during our stay at the Kohala Village Inn that will ensure our success, again, at this year’s Hawai’i Island ‘Ukulele Retreat October 15 – 21, at the Kohala Village Hub in Hawi. It’s not too late to register, but we only have 3 rooms left at the Kohala Village Inn! So hurry, if you don’t want to miss the most fun you can have with your ‘ukulele on, Hawaiian style! Kaliko Beamer Trapp will always hold a special place in my heart. He is the instructor who took this faltering, struggling ‘ukulele beginner with six thumbs on each hand, and got her to the point where she could change chords, strum, and sing (in Hawaiian). . . . .all at the same time. . . . .and with a certain amount of ease! So Kaliko was a natural choice to teach our beginning ‘ukulele classes at the Hawai’i Island ‘Ukulele Retreat last year, and, of course we had to bring him back. Kaliko’s fun-loving approach to ʻukulele and his ability to make everyone feel at ease as they chart new territory will be a huge benefit to all beginners at this year’s retreat. But what he brings for everyone else is every bit as valuable: a unique opportunity to gain a deeper understanding of Hawaiian music, culture, history, language, and tradition . . . . . a very welcome addition and important piece of the puzzle that makes up the Hawai’i Island ‘Ukulele Retreat. Kaliko, is the hānai (adopted) son of the late Aunty Nona Beamer and brother of famed Hawaiian slack key guitarist, Keola Beamer. He is an avid student of Polynesian culture and language and is a lecturer in Hawaiian Language at the University of Hawai’i at Hilo. And he will tell us stories. Kaliko is a fabulous and gifted story teller who lovingly, and respectfully, recounts the ancient tales of his adopted homeland in the most entertaining manner. (Last year, Kaliko’s “story time” was the highlight of the afternoon for many of us.) 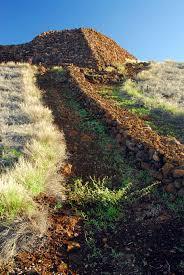 Time permitting, he may also be our personal guide for an optional visit to Pu’ukoholā Heiau, a temple built by King Kamahameha and dedicated to Kū, the Hawaiian war god, and other local historic sites. We couldn’t ask for a more informed, compassionate, or entertaining guide as we explore the music, culture, and history of Hawai’i. We sincerely hope you can join us. Brad Bordessa has been with the five-year-old Hawai’i Island ‘Ukulele Retreat from the beginning. But I have known him much longer than that. We first met at Keoki Kahamoku’s Hawaiian Lifestyle Workshop in Pahala, back in 2007. Brad was just 14 years old at the time, but even then, he showed amazing promise and a passion for music that went well beyond wanting to “wow” everyone with youthful skill and speed. He was hungry to learn and eager to share what he was learning with everyone around him, but he did it in an unassuming and generous manner. Barely in their teens, Brad and a friend created Live ‘Ukulele, one of the first on-line blogs devoted exclusively to the instrument. That blog, now more than 10 years old, is still maintained by Brad and is updated regularly with lessons, tabs, and gear reviews. To this day, it is a valuable resource for all students of the ‘ukulele. Over the years, Brad, who now lives in Honoka’a, just over the hill from Hawi, has been mentored by the very best: Chuck Moore, George Kahumoku, Herb Ohta, Jr., and James Hill. And while Brad is an amazing performer and a thoughtful and talented songwriter, he also excels at sharing with his students all he has learned from the masters in an easy-going, informative manner that is easy for “adult learners” to comprehend. Brad is always on the look-out for things he thinks we need to learn and ways to teach complex concepts in an understandable fashion. That’s what he brings to the Hawai’i Island ‘Ukulele Retreat each year, That’s why we keep asking him back. 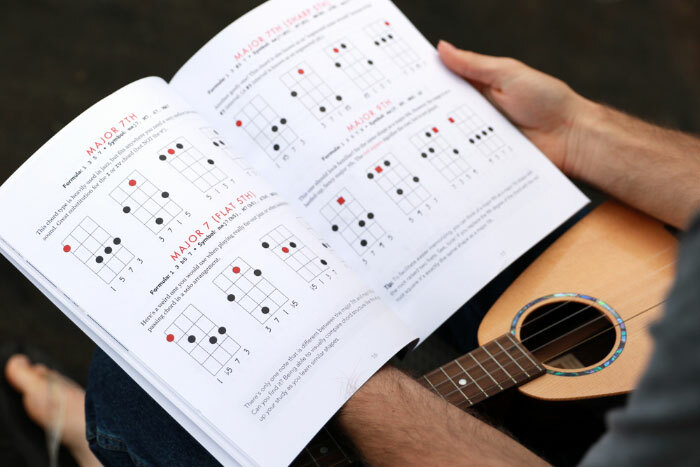 Among other things we can expect from Brad at the retreat this year are some definitive workshops on ‘Ukulele Chord Shapes, since he just wrote the book on that subject. He’ll also be teaching us how to play using our ears–and not our eyes–and how to strum and pick to deliver a cleaner, more polished, sound, over all. For more advanced players, Brad will be teaching a brand new workshop on how to tab out some favorite tunes, so you can create your own arrangements with a little finger picking, alternate chords, and chord melody. And he’s putting together a jam of contemporary Hawaiian tunes. Brad joins an all star line-up at this year’s retreat in Hawi, October 15 – 21, with Gerald Ross, Kevin Carroll, Kaliko Beamer Trapp, Lady Ipo, and KonaBob and will be adding to an already comprehensive list of classes and workshops for ukulele players of all skill levels and genres. While the Kohala Village Inn is totally booked, you can still register for this year’s retreat if you can find someplace nearby to stay! (Search Airbnb or VRBO for Hawi–there were still some great options available the last time I checked!) Or, feel free to contact us in case there have been any last minute cancellations. Guess who’s coming to Hawi? No doubt about it, some of the folks who come to the Hawai’i Island ‘Ukulele Retreat are hankering for ways to expand their musical repertoire beyond the ‘ukulele. Consequently we will be extending this year’s offerings by bringing in the “King of Swing,” the inimitable Gerald Ross, who will be teaching not only ‘ukulele, but Hawaiian lap steel guitar, as well. Not only are Gerald’s workshops top-notch, but he is also an amazing band leader with a propensity for putting together some stellar bands on the fly, and bringing out the best in everyone! He is a jam master extraordinaire and his musical repertoire seems limitless, from tunes of the Big Band era to the slinky tones of surf music. . . . . and beyond. Gerald joins a stellar cast of characters already committed to this year’s retreat, including Hawai’i Island’s own KonaBob, Brad Bordessa, and Kaliko Beamer. So, you know we’re in for a week of wonderful ‘ukulele instruction, camaraderie, and good-hearted fun. There’s more to come, including a few additions to the staff, but in the meantime you should know that registration is now open and we’d love to have you join Gerald and the rest of the crew at the Kohala Village Inn, in the lovely little town of Hawi, October 15 – 21. As we wait for confirmation from some of our staff members, I thought you might like to see some of the “special events” we’ll be hosting at the Hawai’i Island ‘Ukulele Retreat, October 15 – 21. (These are in addition to our usual round-up of ongoing ‘ukulele, bass, lap steel, and hula classes and individual workshops.) We’ve gt a little bit of everything: star gazing with a pwo navigator, hikes to ancient temples, an ‘ukulele beach party, outrigger canoeing, and more. 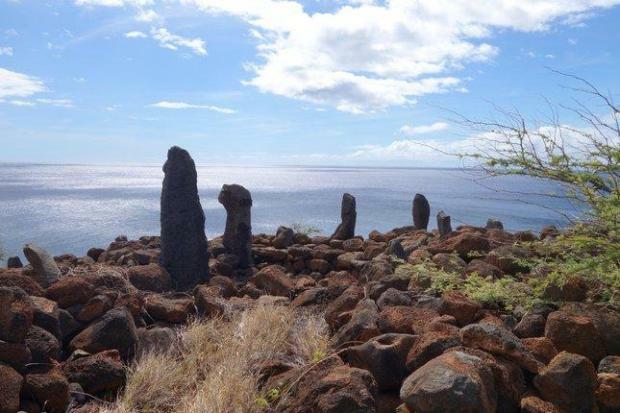 Those hoping to absorb some local history can join us for a short (1.8 mile) early-morning hike and photo opportunity along the lovely Kohala coast, strolling past inviting crystal clear coves before a very short scramble up to Maka o Hule Navigation Heiau, an ancient temple of upright stones that point, with remarkable accuracy, to ancient seafaring destinations thousands of miles away, a testament to the unsurpassed navigational skills of the ancient Polynesians. At least a century before the Europeans made landfall in the Americas, Polynesians were actively engaged in trade with various peoples in South America and North America, introducing the locals to chicken and returning to Polynesia with sweet potatoes. They voyaged out of sight of land for weeks at a time, navigating thousands and thousands of miles of open ocean without a compass or chronometer, using their encyclopedic knowledge of the sun, the moon, the and the stars, tides, winds, currents, clouds, and ocean swells, animal migration, weather patterns, and changes in the color of the sea. It is said that a Polynesian navigator could tell by the shape of a mid-ocean wave whether or not it had crested an island in the past 2 weeks. 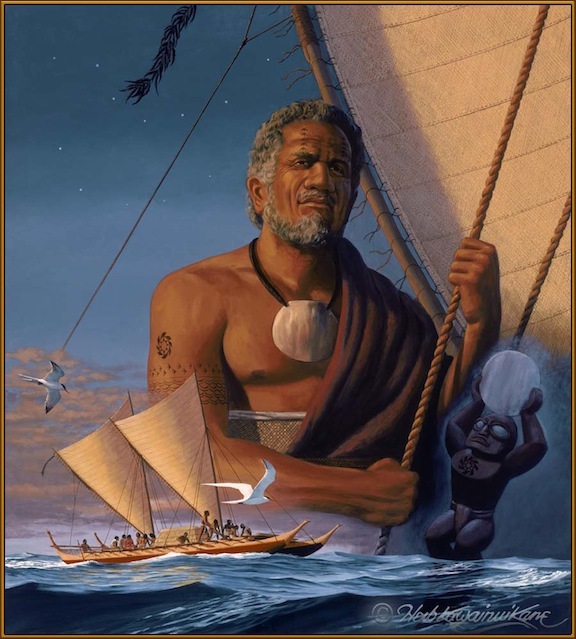 A brotherhood of experts, trained to have acute powers of observation and memory, the Polynesian navigators were also priests responsible for conducting the rituals of their profession, invoking spiritual help in their voyages, and passing their profound skill and knowledge on to the next generation. This they did with songs or chants, repeated until mastered and memorized, at temples such as Maka o Hule, where we will have opportunity to view and appreciate the sacred stones pointing across the vast and tempestuous Pacific Ocean to the islands of Tahiti, the Marquesas and the other Southern Islands. While you wan’t be paddling across vast stretches of the Pacific, through a special arrangement with the local canoe club, we can offer hour-plus rides and paddling instruction down at Kawaihae to retreat attendees for a $100 surcharge. What a great way to experience Hawai’i as the Hawaiians do and to kick-off our annual Beach Party BBQ and KaniKaPila, held this year at Spencer Beach State Park. But if outrigger canoeing doesn’t float your boat, you can join us for a short walk along the Ala Kahakai, a National Historic Trail, followed by a ranger-led tour of Pu’ukoholā Heiau, one of the best-preserved and most significant temple sites in Hawai’i, built by Kamahameha the Great and dedicated to the war god, Kū. This is just a smattering of the Hawaiian history to be learned here…..all within a few steps of Spencer Beach, one of the few white-sand beaches on the Big Island, where, after our tour, we will eat and swim and snorkel and kanikapila until they toss us out. 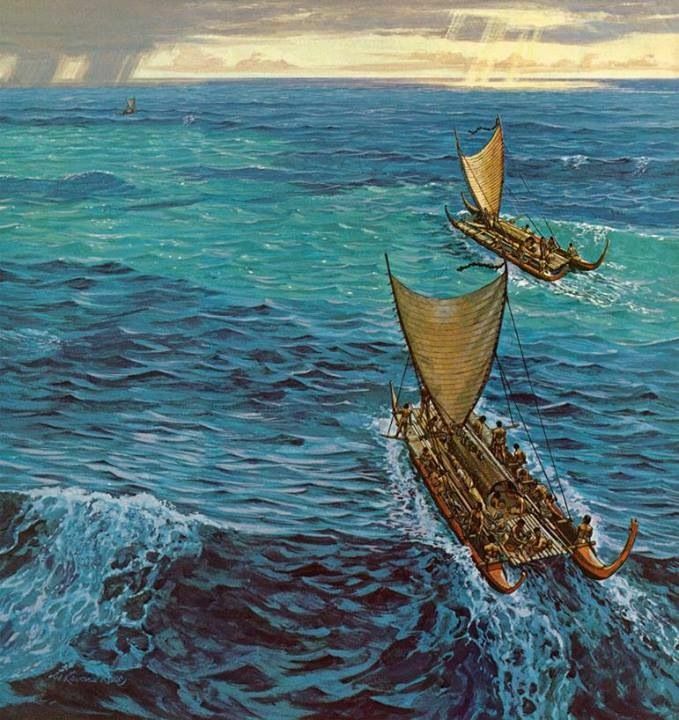 Remember the Polynesian navigators we were just talking about? 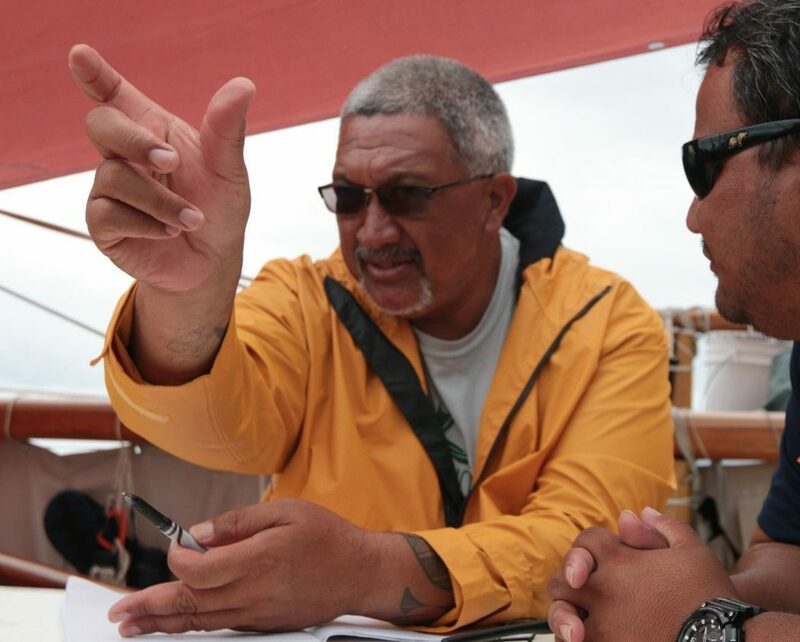 Well, before we head home for the evening, we will be joined by Chadd ‘Ōnohi Paishon, pwo navigator and captain of Hawai’i Island’s own voyaging canoe, Makali’i, and the voyaging organization Nā Kālai Wa‘a. As the star begin to fill the sky, Chadd will guide us on a fascinating star gazing voyage through the darkness, a perfect way to cap an extraordinary day at Kawaihae. How did we ever get so lucky? And all of this is in addition to daily classes and workshops in ‘ukulele, lap steel guitar, bass, and hula, not to mention ongoing evening entertainment in one of the lovliest locations on the island, the Kohala Village Hub. Wouldn’t you like to join us? Registration is now open and we still have rooms available in all categories. But hurry, they won’t last. If you want to stay on top of things, enter your email address to subscribe to this website and receive the latest news via email. Use our link to save 5% on airfare!